Shire Plc. held over 50% of the global short bowel syndrome market in 2015, pointing towards highly consolidated nature of this market. Transparency Market Research (TMR) observes that strategic acquisitions have helped the company in staying ahead in the market over the past few years. “Several players are engaging in the clinical trials of drugs specifically for the treatment of SBS in order to expand their shares in the market over the coming years,” says the author of the report. 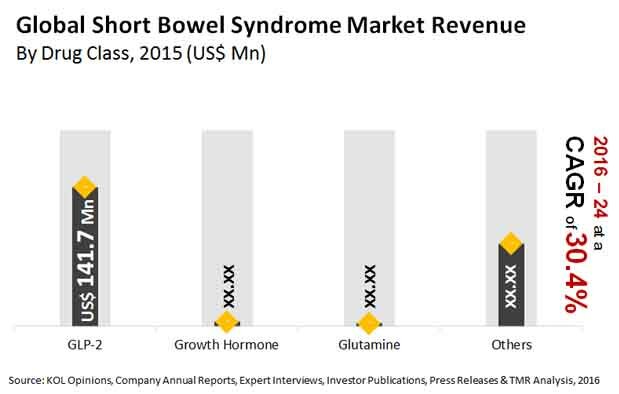 The opportunity in the global short bowel syndrome market was worth US$312.7 mn in 2016 and is poised to reach US$2,618.7 bn by 2024, progressing at an impressive CAGR of 30.4% therein. On the basis of drug class, the GLP-2 segment will continue to dominate until 2024, accounting for whopping 90.3% of the overall market value. The growth of the segment can be attributed to the burgeoning sales of Gattex/Revestive in the U.S. and Europe. This drug also enjoys the status of being the only approved drug for the treatment of SBS in Europe. Moreover, it has been awarded an orphan drug status coupled with exclusivity until 2019, resulting in a barrier for the entry of similar molecules in the market. Owing to all these factors, the segment is estimated to post a remarkable CAGR of 32.4% during the same period. North America will continue to be the leading regional market until 2024, representing 71.5% of the overall market revenue. The presence of favorable reimbursement and cost-sharing scenario is supplementing the growth of the region. Moreover, pre-marketing strategies adopted by the market players to create awareness among populace regarding treatments and their benefits are contributing to the growth of the region. The high cost of parental nutrition, which is dispensed to a patient to facilitate intestine to adapt to the changes and maintain hemostasis, is creating an upswing in the global demand for short bowel syndrome drugs. Favorable reimbursement scenario, particularly in North America, and the increasing supportive measures taken by companies for patients are augmenting the market. The high unmet clinical needs are also working in favor of the global market. “The low rate of diagnosis of short bowel syndrome due to its rarity and difficult access to approved drugs is creating a dire need for increased number of approved SBS drugs,” says a TMR analyst. Furthermore, a raft of associations and foundations are investing large sums in campaigns and programs to raise awareness regarding the syndrome, which in turn is providing a fillip to the market. Moreover, increasing initiatives, such as research and development grants, fee reductions, and tax credits, by government organizations worldwide are catalyzing the growth of the market. The various side effects associated with approved SBS drugs can lead to serious complications in patients. Some of the common side effects are abdominal pain, headache, and vomiting; and blockage of bowel and polyps in the colon in the case of severe complications. The side effects are leading to decreased usage of these drugs, thereby adversely affecting the growth of the market. Moreover, the high mortality rate associated with total parenteral nutrition (TPN), which is usually the primary line of treatment for short bowel syndrome, is negatively impacting the growth of the market.